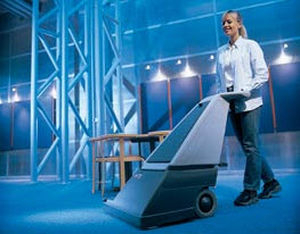 An upright vacuum cleaner is a vertical vacuum unit which usually can stand alone in an upright position. The handle is inclined and pushed to maneuver the machine. The body includes the large cleaning head, dust bag and motor, and the handle often has a detachable hose for hard-to-reach areas. Some cleaning heads contain rotating brushes to help remove dirt from carpets and floors. These machines may be designed for domestic cleaning or maintenance purposes in public and commercial buildings, such as hotels, offices, schools and stations. When choosing an upright vacuum cleaner, consider whether its size and dust capacity is appropriate for the area to be cleaned. The motor should generate adequate suction without being too noisy. Weight and dimensions will affect ease of transport and use. Favor robust designs with shock-resistant components. Blockages should be easy to remove and bags and filters simple to change or empty.